New York, NY (September 12, 2016) – Producer Stacey Mindich has announced that the Broadway premiere of the new musical Dear Evan Hansen has found a new home: it will officially open at the Music Box Theatre (239 West 45th St), and not at the Belasco Theatre, as previously announced. All dates remain the same; the show will still begin previews on November 14, 2016, with an official opening night on December 4, 2016. Customers purchasing tickets on Telecharge.com or by phone prior to September 18 may be sold Belasco tickets, but they and all Belasco ticket holders will be notified via email or telephone regarding the method of exchange to the Music Box. All previous transactions will remain intact, customers will have comparable, if not identical, locations at the Music Box Theatre. With a book by Obie Award-winner Steven Levenson, score by Tony® Award nominees Benj Pasek & Justin Paul, and direction by 3-time Tony® Award nominee Michael Greif, Dear Evan Hansen had its world premiere at Arena Stage, Washington D.C., this past summer and recently concluded its record-breaking New York debut at Off-Broadway’s Second Stage. Platt will be joined by Laura Dreyfuss, Rachel Bay Jones, Jennifer Laura Thompson, Mike Faist, Michael Park, Will Roland and Kristolyn Lloyd. Dear Evan Hansen recently won ‘Best Musical’ prizes from the Obie Awards, Outer Critics Circle Awards and Helen Hayes Awards. It was also nominated for Distinguished Production of a Musical from the Drama League Awards. Among its many honors, Michael Greif won the Helen Hayes Award for Best Director of a Musical; Ben Platt won an Obie Award for Performance; Steven Levenson won the Outer Critics Circle Award for Best Book of a Musical; and composers Benj Pasek & Justin Paul won the Drama Desk Award for Outstanding Lyrics. 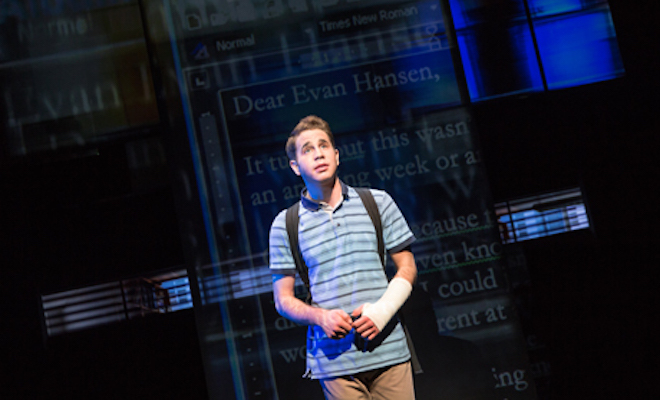 Dear Evan Hansen features scenic design by David Korins, projection design by Peter Nigrini, lighting design by Japhy Weideman, costume design by Emily Rebholz, and sound design by Nevin Steinberg. Music supervision, orchestrations and additional arrangement are by Alex Lacamoire. The musical director is Ben Cohn. Vocal arrangements and additional arrangements are by Justin Paul. Danny Mefford is the choreographer. Casting is by Tara Rubin Casting. Adrienne Campbell-Holt serves as Associate Director. Judith Schoenfeld will serve as Production Stage Manager, with Michael McGoff as Stage Manager. Jayne Hong and Rachel Weinstein are Associate Producers. 101 Productions serves as Executive Producer. Dear Evan Hansen is produced on Broadway by Stacey Mindich, Mickey Liddell, Hunter Arnold, Caiola Productions, Double Gemini Productions, Fakston Productions, Roy Furman, Harris Karma Productions, On Your Marks Group, Darren Bagert, Bob Boyett, Colin Callendar, Caitlin Clements, Freddy DeMann, Dante DiLoreto, Bonnie & Kenneth Feld, FickStern Productions, Eric & Marsi Gardiner, Robert Greenblatt, Jere Harris and Darren DeVerna, Mike Kriak, Arielle Tepper Madover, David Mirvish, Eva Price, Zeilinger Productions, Adam Zotovich in association with Arena Stage and Second Stage Theatre. Tickets for Dear Evan Hansen ($49.00 – $149.00) are available at Telecharge.com or by calling 212-239-6200. The Music Box Theatre box office (239 West 45th Street) opens on October 3, 2016. The schedule for Dear Evan Hansen, beginning November 14, is as follows: Monday-Friday at 8PM; Saturday at 2PM & 8PM, Sunday at 3PM (no performance Nov. 20). As of December 5, the schedule is Tuesday – Thursday at 7 PM; Friday at 8 PM; Saturday at 2 PM & 8 PM; Sunday at 2 PM & 7:30 PM. After March 6, 2017, the schedule shifts to: Tuesday and Thursday at 7 PM; Wednesday & Saturday at 2 PM and 8 PM; Friday at 8 PM; Sunday at 3 PM.